Chutneys or dipping sauces are a must with most indian dishes be it snacks, chaats, main dish or whatever. 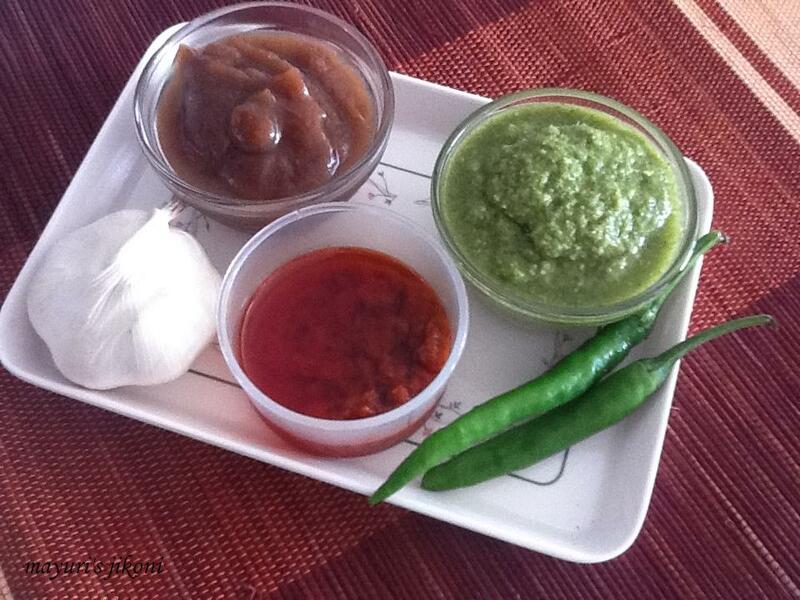 Today I will blog the recipes of the 3 most common chutneys. Personally, I don’t like having samosas, kachoris, dokhras etc with chutneys as they just tend to mask the actual taste but I know a lot of people who cannot live without these chutneys. I love green chutney sandwich, the garlic chutney with patuda no lot, and date chutney with chaats. Usually my chutneys are not too hot so adjust the amount of chillis you would like. I believe that really chilly food just masks the taste of the other ingredients. The green and date chutney can be frozen into smaller batches. The garlic chutney keeps well in the fridge for months if you have added enough oil. Grind the peanuts to a fine powder. Put the coriander, mango, ginger and chilli paste, jaggery and water into a blender and liquidize the mixture. Take out the mixture into a bowl. Add peanut powder, cumin powder and salt. Mix it well. Can add about ½ tsp garlic paste if you like. I normally don’t add any so any leftover chutney can be used for Ekadashi. If you don’t want to add raw mango then increase the amount of coriander and add lemon juice. Instead of peanut powder can add cashew nut powder or ganthias. Take half coriander and half mint. Wash the dates and tamarind thoroughly to remove any grit present. Put them in a pan along with the water and let it simmer over low heat till the dates and tamarind becomes soft. Remove any seeds and fibre if any are left. Put the mixture along with the remaining water into a liquidizer and process it into a puree.If need be add a bit more water. When it is hot add the cumin seeds and curry leaves. When the curry leaves become crisp, add it to the date tamarind mixture. Add salt and chilli powder and mix well. Add about 2 tbsps of ready made tamarind paste if you don’t get any tamarind. If the chutney consistency is too thick add a bit of water but don’t make it too watery. A pinch of hing (asafoetida) added with the curry leaves gives the chutney a different flavour but then you cannot use it for Ekadashi. Add salt and red chilli powder to it. Heat the oil tills its hot. Add it to the gralic paste. If the oil is less, heat some more and add to it. Add more oil as the garlicky oil can be used with khichdi, dokhra, etc. Make sure the garlic paste is submerged in the oil if you want it to stay fresh for a longer period.